A non-free standing shelter by design that works well with a variety of conditions and platforms. It can be pitched with a pair of trekking poles or in between two trees. 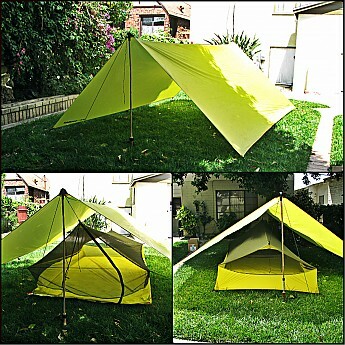 It's a versatile shelter that can be used as a ground shelter or even as a hammock tarp. Since this is a modular system, the weight can be easily be distributed between two people. 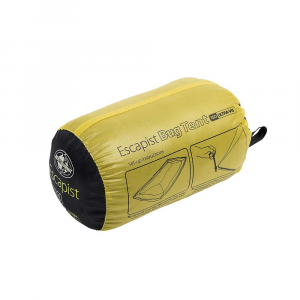 Best used for 3-season backpacking and can be used as a solo or 2-person shelter. Lightweight at 2 lbs. 1 oz. Among all the shelters I have owned, this Sea to Summit Escapist became my favorite. Having experience with using tarps and tarp shelters, it was easy for me to utilize this type of shelter system. For the Escapist Shelter System I tested this Escapist Ultra-Mesh Bug Tent with the Escapist 15D Tarp with and Escapist Groundsheet. 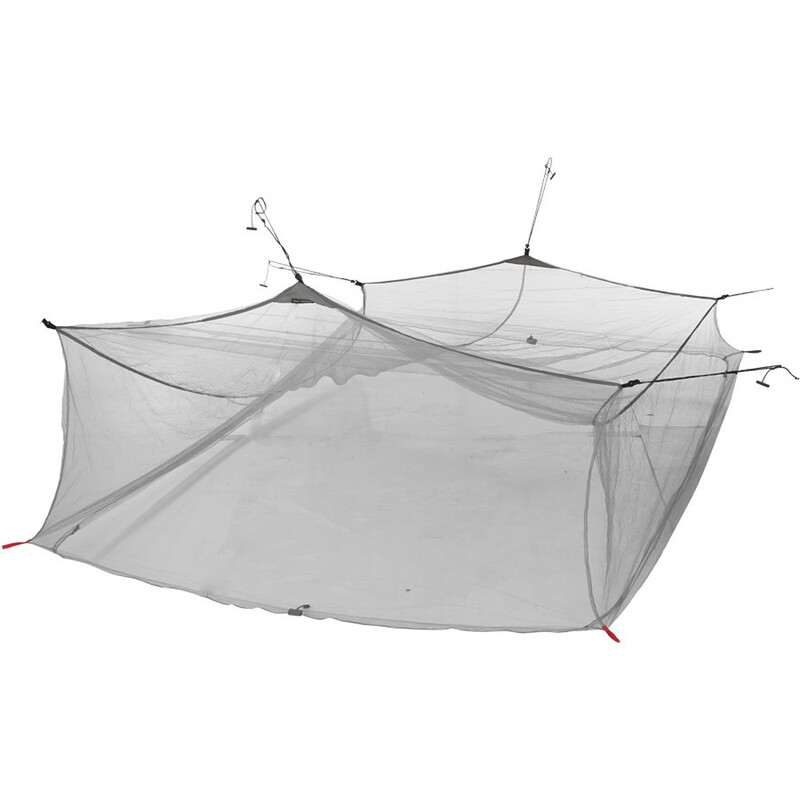 Sea to Summit also offers an Escapist Ultra-Mesh Bug Net for the system. I do have to warn those that have no experience with tarp style shelters, you need loads of practice and patience when setting this up. With the various guyout points and the fact that the inner tent has to be setup separately, it can be quite a challenge. I would honestly recommend this shelter for those who have experience with tarps, simple knots, and a proclivity with site selection. I was quite excited when I received this shelter. I've always been a fan of the versatility of a tarp system. There are a multitude of use for this kind of backcountry shelter. With my style of backpacking, I found that the STS Escapist fit my need perfectly. First things first, the weight. 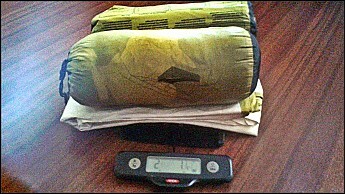 The tarp, inner tent, and groundsheet together weighed 2 lbs. 1 oz. I was a bit sad though that the shelter did not come with the 10 stakes you needed to pitch. Luckily I had a few of those on hand. I purposely did not include the weight of the stakes only because this was not included. Out of the box, the fabric felt light and fragile. However, don't be fooled by this. 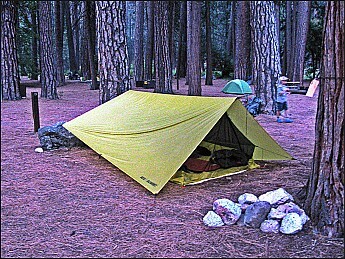 The 15 Denier Silnylon used for both the tarp and inner tent is very strong and durable. 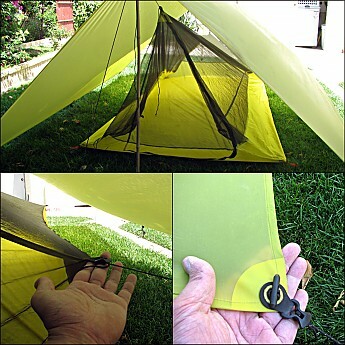 In a pinch, I would use the tarp as a makeshift bivy without worrying about punctures to the fabric. As I mentioned, this is a shelter system that requires practice and patience. Once you have that down, it's not as difficult as it looks to set this up. Personally, when I used this shelter, I opted to pitch in between two trees due to the ease of the setup. Let's go over some of the features of this system. 8 Stakeout/Guyout Points, all reinforced. 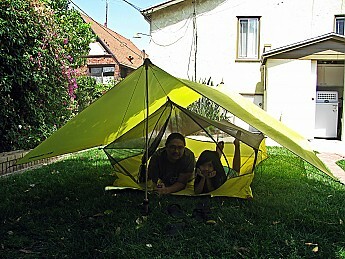 The inner tent paired with the 10 x 10 shelter can easily fit two people. Though, the single entry could cause you waking up your partner on those needed "middle of the night" calls. As usual, living in Southern California, rain has been hard to come by this year. Though I have no doubt of it water resistance, I will need to update this review once I encounter some weather with this shelter system. Same with wind, the most I've encountered was maybe a 15 mph wind — still not a true test. However, that one evening with wind, my shelter barely budged. The guyout points held true for me. What condensation? With how this shelter is designed, condensation was never an issue during my use of this system. With how the air flows inside the system, whatever moisture there is is being dried off quick. The Sea To Summit Escapist Shelter is a well-made shelter system. I would recommend this shelter for backpackers looking to cut weight on their shelter and also recommend for those looking for versatility. 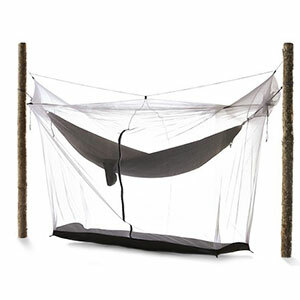 As mentioned, the tarp can be used as a hammock tarp or as a stand-along tarp shelter on those bug-free evenings at camp. 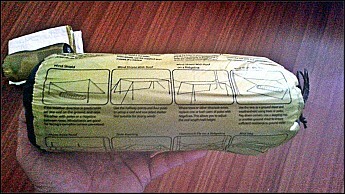 The stuff sack even comes with instructions/diagrams on the many ways you can set this shelter up. 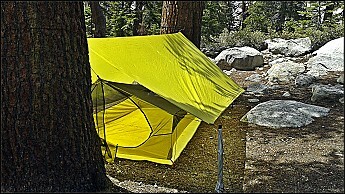 It can also be used as a group shelter looking for a quick escape on those Sierra surprise downpours (though on my time using this, not one drop). One thing to note, this shelter is not for the inexperienced. Requiring 10 stakes total, it takes some practice and patience to set this up. Additionally, the color option for the system is limited to the yellow color. For those looking to "blend in," this might not be the best option. Personally, I didn't mind it. I actually like the bright color, this helps me spot my shelter from far away. 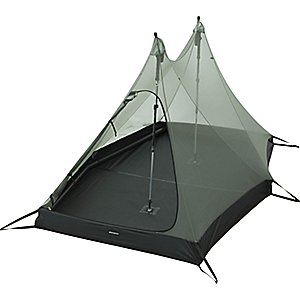 I tested this Escapist Ultra-Mesh Bug Tent with the Escapist 15D Tarp with and Escapist Groundsheet. 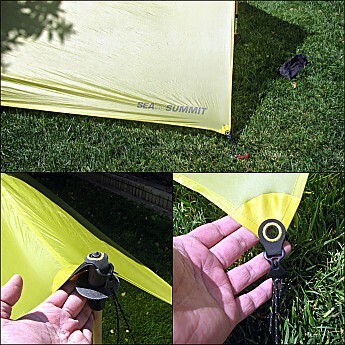 Sea to Summit also offers an Escapist Ultra-Mesh Bug Net for the system. To date, I have used the Sea To Summit Escapist shelter on a multitude of trips from Yosemite and the Angeles National Forest. This was my go-to shelter during my summer backpacking trips. Having an array of shelter selections, I seemed to gravitate to the Sea To Summit Escapist, well, because it's actually fun to setup! 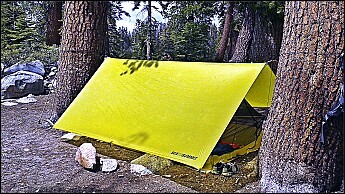 I can't wait to use this shelter on more trips using various tarp pitches. Highly recommended in my opinion. I love getting a 2-for out a a test item! I like the diagrams on the stuff sack. Looks like a nice shelter. Hammockers can side with the infinite tinkering that goes into set-up. Great review! 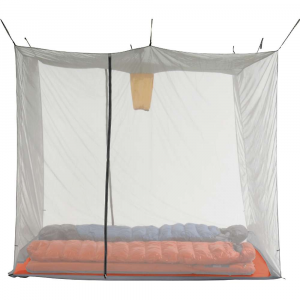 Really wanted to love the large tarp + bug tent combo. Really wanted to love the large tarp + bug tent combo. Gave it 14 nights on the Tahoe Rim Trail — meadows, ridges, trees, granite, mud, wind, and rain. Sheds water like a duck. However, I'm just 5'1" and was unable to sit up under the head end except on nights where I was able to find a near perfect pitching site and didn't need to pitch low due to wind. In order to achieve full height and width at the head end of the inner tent, the front corners of the tarp have to be pitched high. This combo requires a lot of room or trees in just the right places to achieve the result you see in the picture. Sadly, have to return this one. Requires ideal site for the pictured results. Inner tent has 6 rubber bars to attach to tarp, but only 4 places to attach them. Does not fit back into the stuff sacks. 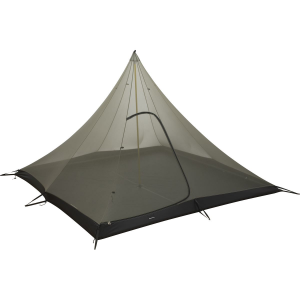 The Sea to Summit Escapist Ultra-Mesh Bug Tent is not available from the stores we monitor.